Native to Russia, Afghanistan and Pakistan. Rapid upright growth habit that becomes somewhat rounded with age. The paired, medium green needles are 5" to 6 1/2" long. The cones are reddish-brown oval to oblong, 3" long. Widely planted for screening and specimen use. Drought, heat, and wind tolerant once established. 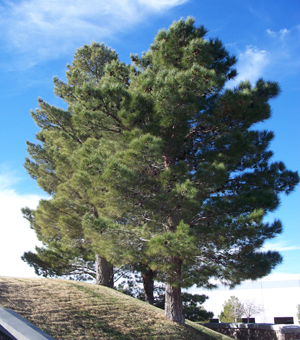 Good pine for alkaline soil conditions. One of the best for screening wind.